10 February 2016. A company discovering new treatments that address errant folding of proteins causing neurological disorders raised $45 million in its first venture funding round. Yumanity Therapeutics, a spin-off enterprise from the Whitehead Institute affiliated with MIT, started in December 2014 and aims to discover therapies for neurodegenerative diseases caused by misfolded proteins. Yumanity Therapeutics is commercializing research from the lab of the company’s scientific founder Susan Lindquist, considered a pioneer in the science of protein folding. Proteins are long polymer chains of amino acids derived from DNA. While DNA is expressed in one linear dimension, proteins are formed in three dimensions by complex folding routines, following the structure encoded in DNA. Should protein chains not fold properly, aberrations can occur including generation of other harmful proteins that disrupt or destroy normal functions. Misfolded proteins can take aim at brain activity, which in some cases can mean the damage or destruction of nerve cells in the brain. These damaging proteins in the brain, such as forms of alpha-synuclein associated with Parkinson’s disease and TDP-43 linked to amyotrophic lateral sclerosis or ALS, can be traced back to misfolded proteins. Yumanity, in Cambridge, Massachusetts, is discovering new therapies that target misfolded proteins resulting in the neurodegenerative disorders Alzheimer’s and Parkinson’s disease, as well as ALS. The company’s technology uses yeast cells as models for errant folding of proteins that serve as a platform for high-speed testing of compounds. Yumanity also derives neurons or nerve cells from stem cells of patients with genetic mutations causing neurodegenerative diseases. 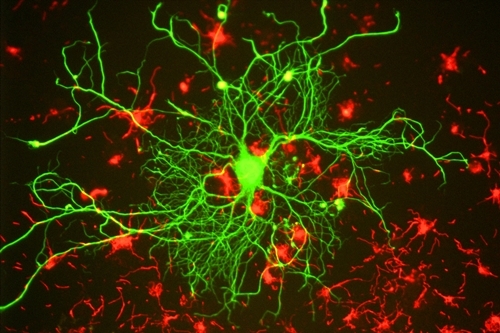 Those stem-cell generated neurons are then used to validate molecules discovered from yeast models. A third part of the technology employs protein network analysis to identify drug targets. The new $45 million venture funding for Yumanity is led by Fidelity Management & Research Company, a division of Fidelity Investments in Boston. Participating in the round are Redmile Group, Alexandria Venture Investments, and Dolby Family Ventures, as well as the venture financing arms of biotechnology companies Biogen and Sanofi-Genzyme. In July 2015, Science & Enterprise reported on a new enterprise started in part by Dolby Family Ventures to develop new therapies for Alzheimer’s disease. Dolby Family Ventures aims to reflect the engineering and entrepreneurial philosophy of Ray Dolby, founder of Dolby Laboratories and inventor of audio noise reduction and other signal processing technologies. Ray Dolby died in September 2013 from Alzheimer’s disease and leukemia.